So the rest of the basketball world is starting to put it all together … these Los Angeles Clippers are pretty darn good. And Lou Williams would know, as seen in his words above, he’s scored the decisive points in back-to-back victories over the past week. The club has won three-straight games, 128-126 in OT over the Bucks last Saturday, 121-116 in OT vs. Golden State on Monday and, Thursday, 116-111 over the pesky San Antonio Spurs. Currently, the balanced Clippers sit at 9-5 on the season. Five members of the squad averages double figures in points. You mean, the most underrated player in the league? Harris leads the squad with 20.2 points per game and is also the team’s leading rebounder (8.8 per game). Gallinari is second with 19 points per game, and he’s the squad’s top shooter behind the arc (.438 3-point %). The reigning Sixth Man of the Year, Williams continues to do damage off the bench (19.4 ppg, 4.1 assists per game) and has basically won the last two games for the Clippers. Ah, yes, the rookie! Gilgeous-Alexander has been nothing short of fantastic in his first 14 games of his NBA career, averaging 10.1 points, 3.4 rebounds and 3.0 assists per game. Who doesn’t love a guy who does ALL the dirty work? Harrell, who’s been called today’s version of Dennis Rodman, is the second man off the bench for the Clippers. He’s second on the team with 6.4 rebounds per game and leads the squad with nearly two blocks per contest. 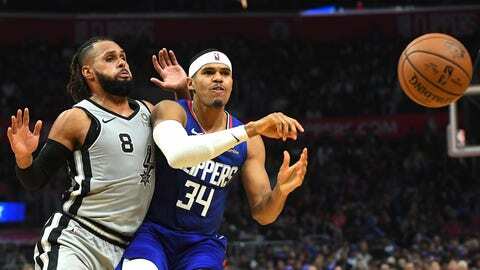 The rest of the squad is a cast of characters, including centers Marcin Gortat and Boban Marjanovic and starting point guard and defensive bulldog Patrick Beverley. The Clippers return to Prime Ticket on Saturday for a 3p meeting with the Nets.